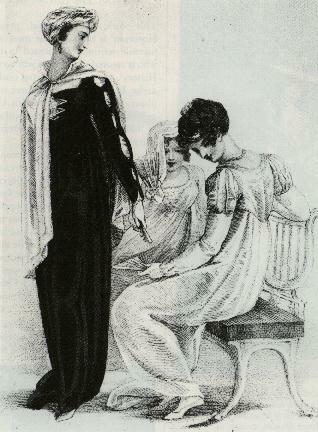 Evening Dress, May 1807, from Le Beau Monde Note how the sleeves and hat of the lady's outfit echo ancient armor. 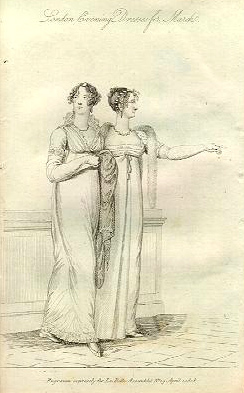 Evening Dresses, 1810, for the opera, from Rudolf Ackermann's The Repository of Arts, Literature, Commerce, Manufactures, Fashion, and Politics, 1809-1829. The standing lady is in a dramatic dress of black slashed to reveal white satin beneath it. She wears a patterned turban and has a short cape clasped around her neck. The lady in the background of the picture wears a veil as part of her headdress. All three women have fans.